Design tools simplify the solution engineering process for sales teams and customers. Before purchasing the hardware for your QuantaStor servers, please review our solution design and hardware compatibility guides to ensure that you're hardware is properly matched to your use case and application requirements. For technical questions or assistance with getting connected with an OSNEXUS partner in your region please contact us via our Solution Design Review (sdr@osnexus.com) or Sales (sales@osnexus.com) team email. 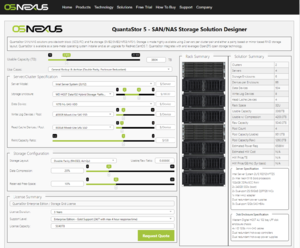 Online web applications for designing QuantaStor systems and storage grids. Covers RAID/erasure-coding selection, space overhead, and numerous design considerations. This page was last modified on 22 March 2019, at 09:56.